Welcome to SC Manufacturing Texas, LLC. 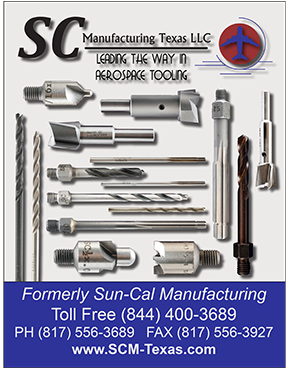 Sun-Cal Manufacturing, a leading manufacturer of cutting tools is now SC Manufacturing Texas, LLC. With over 25 years of experience in the cutting tool industry, SC Manufacturing Texas has become one of the premier suppliers of tools to the aerospace industry and is one of the few manufacturers who can respond to AOG orders with 24 hour service. Located in Joshua, Texas, SC Manufacturing Texas, LLC. serves the aerospace and manufacturing industries nationwide providing standard and custom Piloted Reamers, Piloted Core Drills, Threaded Shank Drills, Step Drills and Piloted Double Margin Drills, and so much more, made to your specifications and needs. SC Manufacturing Texas, LLC. is committed to offering our customers quick and efficient service without compromising quality. We offer both SAME DAY and 24 HOUR AOG SERVICE. We also offer counter-to-counter service in some areas. We are committed to meeting your needs. SC Manufacturing Texas, LLC. looks forward to including you as one of our valuable customers.